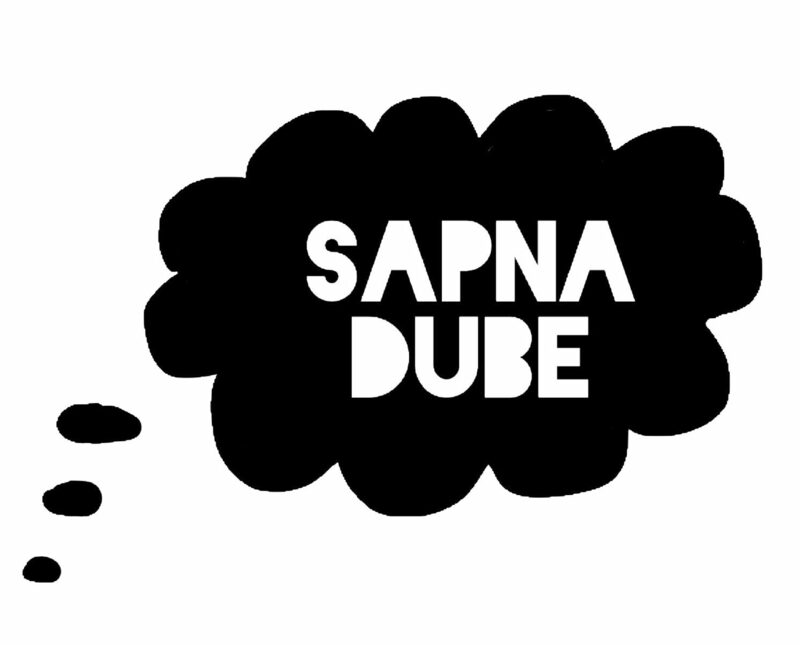 Part of a generation in the 90s that emerged in the wake of the influence of IT and nouveau riche in Bangalore, Sapna Rao Dube is a painter, printmaker, muralist and installation artist. 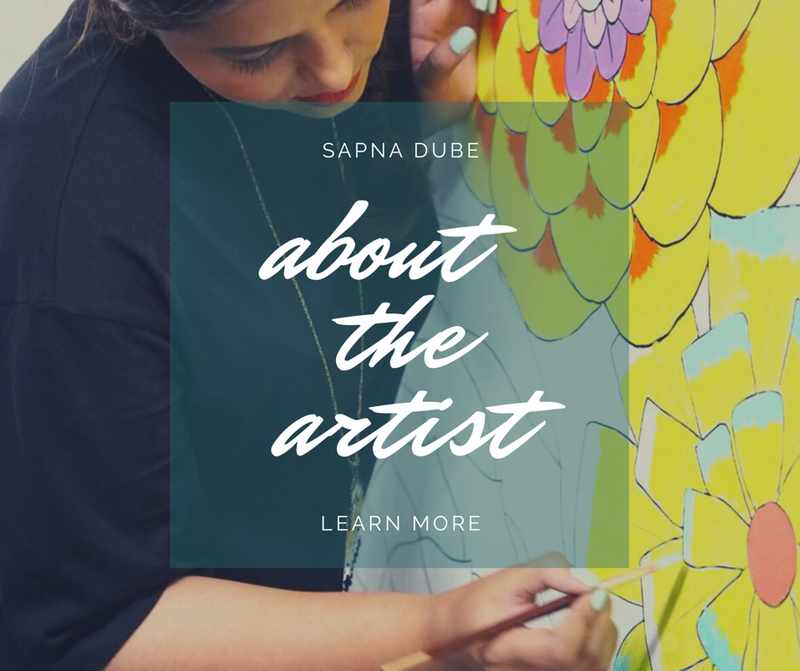 Dube has said “I am a contemporary artist and I speak an international language, but my interest is in things and behaviors that can only be found in India”. Influenced by early Indian artists,in particular the work of KK Hebbar, as well as SS Kukke, Op Art and KG Subramanyam’s work, Dube’s work challenges sexual cliches, addresses truth criteria, fallacy, simulation, representation, geometric inexactitude, hybridism, false glitter, synthetic materials, botanical inaccuracy, shifting titles and entropy. Her distinctly Indian, vernacular colour palette and unique motifs reflect a fascination with village Sante/fair and the print designs of popular fabrics, as well as India’s tropical flora, its folk arts and crafts, embroidery, costumes or jewellery. These influences leak into the paintings and emerge as a colourful amalgamation of visual indexes that are able to syncopate high and low culture, art and craft. Dube saturates the surfaces of her work with complex patterns. Some of these elements don’t really come from the painting world. They are in some sort of conflict that will never really end up anywhere. They are not peaceful surfaces. Dube’s aim is to create compositions with a proliferating, ornamental patterning that keeps the eye moving restlessly across the image surface. 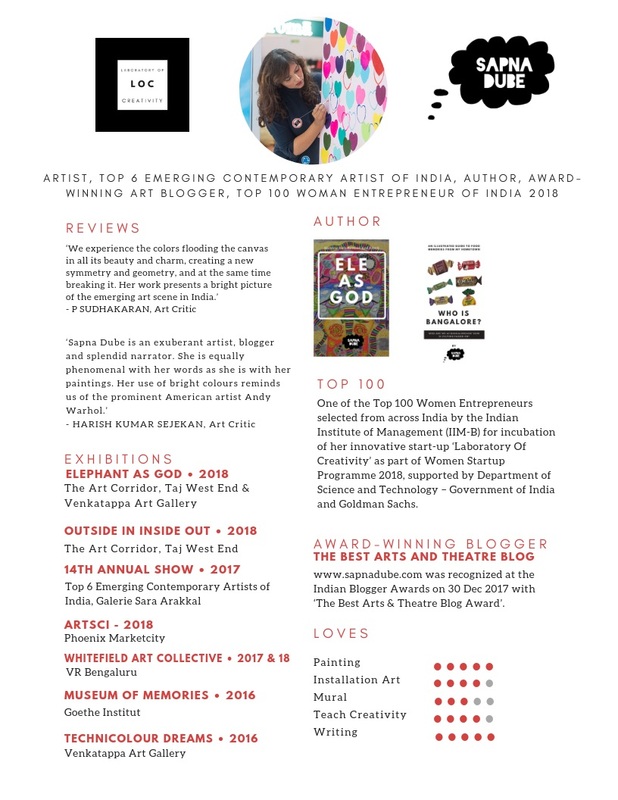 An artist who’s also an award-winning blogger and ‘Artrepreneur’, www.sapnadube.com was recognized at the Indian Blogger Awards on 30 Dec 2017 with ‘The Best Arts & Theatre Blog Award’. Dube is one of the Top 100 Women Entrepreneurs selected from across India by the Indian Institute of Management (IIM-B) for incubation of her innovative start-up ‘Laboratory Of Creativity’ as part of Women Startup Programme 2018, supported by Department of Science and Technology – Government of India and Goldman Sachs. In May 2017, Dube received the ‘Pink Power Award’ which celebrates India’s most exceptional women entrepreneurs for their ideas, innovation and inspiration by empowering them with free retail space and training/mentorship by TRRAIN (Trust for Retailers and Retail Associates of India). 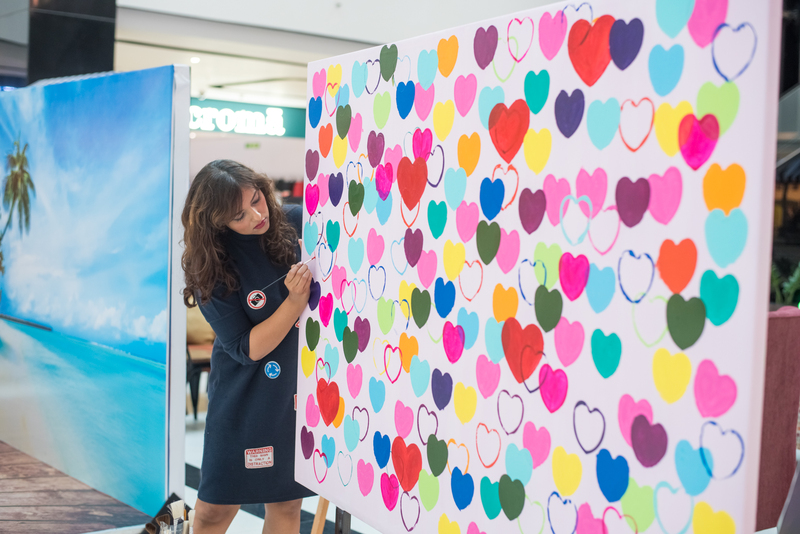 As part of the win, Dube hosted her first exclusive art pop-up at Inorbit Mall, Bangalore in October 2017. In January 2018, she was one of 21 artists chosen to showcase her work at ArtSci, a unique art festival that brings together ancient indian art and science at Phoenix Marketcity, Bangalore. In the same month, Dube was also commissioned for the second consecutive year to create a conceptual interactive art installation titled ‘We Are All Connected By Love’ at VR Bengaluru as part of their annual public art festival, Whitefield Art Collective 2018. In March 2017, Dube completed a commission for VR Bengaluru, titled ‘Childhood’, which fills a giant whitewashed wall with her signature colorful patterns. She held her first solo exhibition in April 2016 at the Venkatappa Art Gallery, Bangalore and Goethe Institut, Bangalore showcased some of her feminist art work as part of Museum of Memories in January 2017. Her work was included as part of Whitefield Art Collective 2017, where the works of 100 leading and emerging contemporary Indian artists was showcased. Dube has also just been appointed as a Creative Arts Consultant by Virtuous Retail. An avid puzzler, she was ranked No.15 in Bangalore at the Times Sudoku Championship in 2014. Dube is also a member of IATDF ( Indian Arts Therapy Discussion Forum) since 21 January, 2017. She lives and works in Bangalore with her husband and three rather social media savvy dogs who you can find and follow via To Forgive Is Canine on Instagram.